Police Chief Kevin Vogel denounced the Department of Homeland Security at a Thursday press conference, saying the federal agency misled Santa Cruz about its series of raids Feb. 13 he said were considered beyond the scope of a criminal investigation. Homeland Security Investigations spokesman James Schwab said Thursday afternoon that a response from that agency is expected, but he had nothing immediately to say. He did say it was unusual for a local law enforcement agency to speak out against a federal one. U.S. Attorney’s Office spokesman Abraham Simmons said his agency would not comment on whether the criminal investigation resulted in non-criminal immigrant detentions. The raids stemmed from a partnership between local and federal law enforcement conducting a five-year investigation into the notorious street gang MS-13 and suspected criminals in Santa Cruz. The investigation included the federal indictment of 10 men ages 20 to 40 who face a variety of charges based on allegations of extortion and trafficking meth. Alfonso Vasquez, who lives at Nueva Vista Apartments in Beach Flats, said he was asleep before dawn Feb. 13, when he heard disruption at his door and woke to federal agents. A group of federal agents forced entry in his home and ordered him to put his hands atop his head. The agents had a federal search warrant authorizing seizure of property linked to gang activity, extortion — such as receipts and documents warranting monies owed — and a variety of electronic devices and electronic storage, according to court documents. Vasquez and his wife, Teresa Escobar, are legal residents of the U.S. Both were asked to provide documentation during the raid at their apartment. Vasquez, Escobar and their children were ushered out of the home in their bedclothes and told to remain outside in the custody of federal agents, Vasquez said in Spanish at his home on Thursday. He was not among the 10 men named in a federal indictment that spurred the bulk of the raids throughout Santa Cruz, Watsonville and Daly City in the hours before sunrise Feb. 13. “It was like an earthquake,” Escobar said about the noise when officers broke open their door, which remains damaged and is going to be repaired by the apartment complex. A 10-year-old girl at the home also was told to put her hands on her head and go downstairs while officers searched the premise. Vasquez said the officers wore blue and green uniforms. After officers left his home, they left a copy of the search warrants on his couch. Thursday’s press conference revealed new information about those detained and questioned about their immigration status in an investigation that had a criminal nexus. 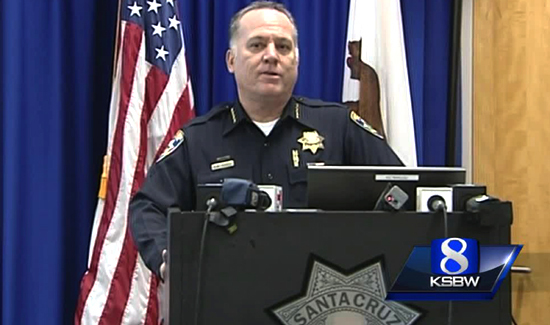 During the press conference, Vogel was flanked by Santa Cruz Mayor Cynthia Chase and Deputy Chief Dan Flippo. Vogel said there were 12 arrests in the city, county of Santa Cruz and Daly City related to a gang investigation originating with his department. The Santa Cruz Police Department lent resources to the federal raids despite the city’s status as a sanctuary city. Vogel said the Police Department was led to believe the investigation intended to remove criminals from the streets and the roundup of 12 alleged gang members helped to dismantle the transnational gang MS-13’s local affiliations. In 2010, the Sentinel reported on arrests tied to MS-13 members in a joint federal-local investigation. That investigation included the arrest of alleged gang member Jose Abrego Galdamez. Galdamez was deported three times, the latest in 2005, according to court documents. Police said that man had deep gang ties. His name is similar to one of the 10 men indicted and arrested Feb. 13 by Homeland Security Investigations: Jose David Abrego-Galdamez. Vogel said he was uncertain whether this was the same person. Vogel and Chase said they apologize to the families who have been separated by the detentions, but Flippo said there is a lack of information about those detainees. Vogel added that the agency cannot trust Homeland Security and will no longer work with the federal agency. At its meeting on Tuesday, the Santa Cruz City Council is scheduled to discuss the city and police department’s immigration policies. The Feb. 13 operation was targeting 12 alleged Mara Salvatrucha, or MS-13 gang members identified through years-long investigation into drug trafficking and extortion allegations. The case began as a local inquiry into threats by gang members and grew into a federal case. Vogel said Homeland Security assists with local law enforcement investigations because they are able to pursue leads across state lines. I don’t think Chief Vogel can logically explain why ICE should trust an employee of an avowed Sanctuary City. So what will the city do to stop the gang violence? Nothing as usual. Maybe this politically correct Chief should step down and let someone actually do the job.